The ‘wrong side’ of some fabrics is sometimes just as beautiful as the right side and can make a more interesting choice for a design. Cotton prints reversed can have a faded vintage feel, the reverse of some brocades show the pattern in bands of stripes and jacquards can have a striking positive/negative effect that begs to have both sides showing. 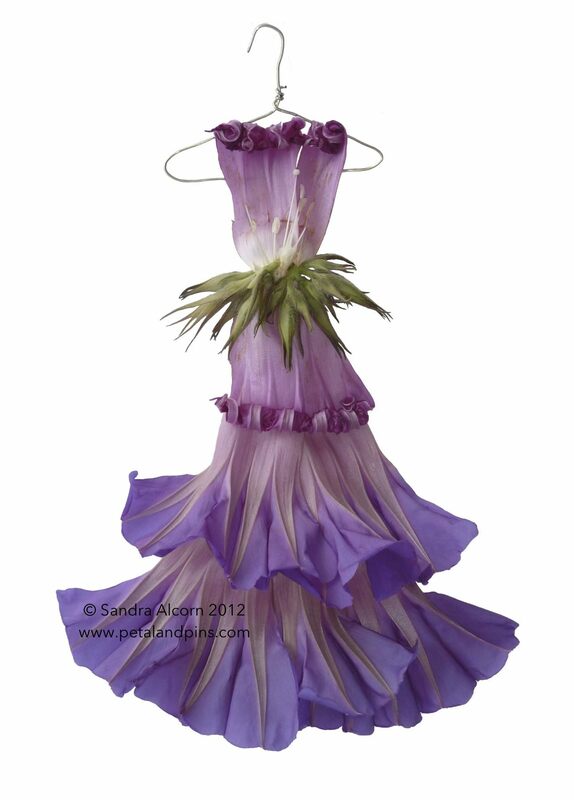 The underside of the Morning Glory flowers revealed softer shades of purple and a pleat like texture that inspired a very different look to the previous Garden Fairy’s dress – which is your favourite? Love the latest morning glory! Both dresses are very pretty, but I prefer the more vibrant purple shade of the previous dress. That is a beautiful dress Sandra, probably my favorite.